You are here: Home / Blog / Eugene rides Europe / 650km with very little effort! 650km with very little effort! So again I get rained on and wake up to clear skies. This time it is a little cooler morning and I have to pack up wet tents etc. Normal procedure in the morning but now we have made some really nice camping buddies. So departure took a while to greet everyone – Dave, his son Lewis, Andrew, Jos and Marina. Also another Lewis that had arrived the previous day and of course the owner Mel. Grenoble was only 45 km away but with road closure for the race we could not risk the wrath of the French gendarmerie and left just after 8 am. It is also all downhill and barely had to turn a pedal in anger. So with lots of time available I stopped for two cups of coffee and croissants in Vizille. 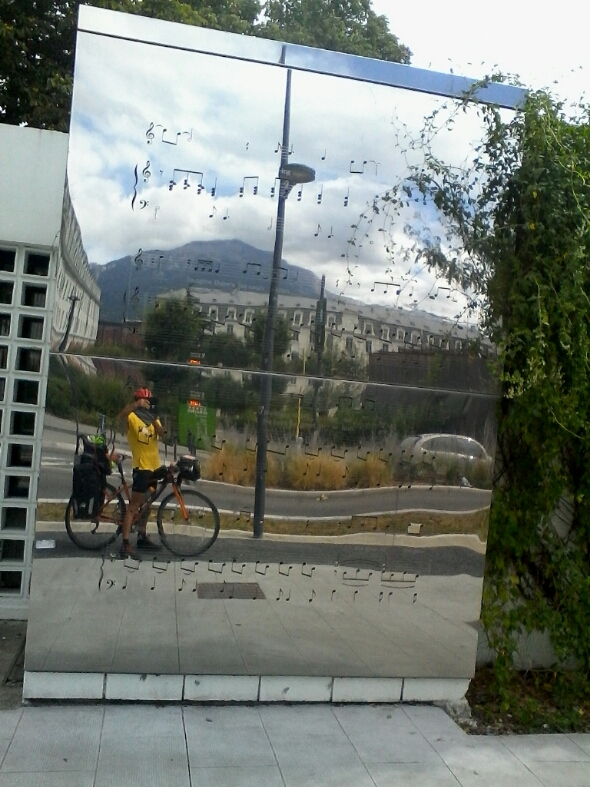 I pedalled on into Grenoble and explored the centre of town. I passed this very interesting building with the words of John Lennon’s “Imagine” on all the surrounding walls. I could not find out if it was a recording studio or just owned by a Lennon fan. 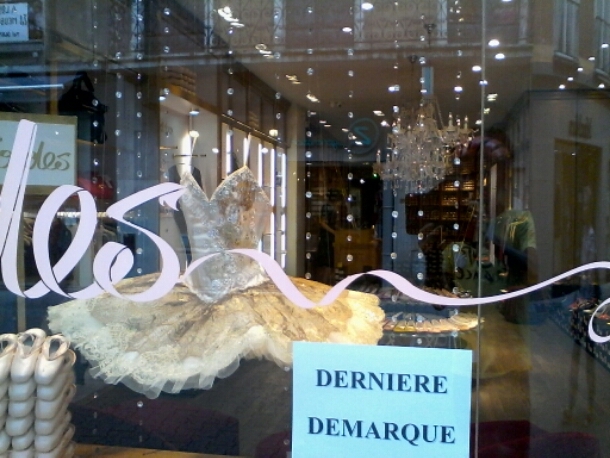 I also found a really nice shop owned by a ballet dancer that made all the tutu’s and shoes herself. Her work was outstanding and I took some photos for my granddaughter, Steffy-Lea. Then I needed lunch and looked to a place to eat at. I chose an eating house styled American with pictures of James Dean and other movie stars but importantly had cold beer, TV and wifi. The beer was great but the food was average and very limited menu. So my first greasy burger with chips for two and a half months cost 19 euros or R263.50 and included a beer. Not that I was doing the conversion thing but I did feel hard done by when I get two great steaks with salads and a beer at Monticello’s in Sedgefield for about the same price. So be warned Anita and Craig I wil be home soon to enjoy your fare!!! We watched Froome successfully defend his yellow and our guys hold their position on GC so I was happy to board the TGV for Paris. 650 km later I booked in to Ibis hotel because they are a TdF sponsor and also very close to the Champs Elysée for the finish tomorrow……..
https://i2.wp.com/www.cycleworx.co.za/wp-content/uploads/2015/07/wpid-wp-1437865155346.jpeg?fit=600%2C800&ssl=1 800 600 Eugene Roux https://www.cycleworx.co.za/wp-content/uploads/2018/10/sycleworx_logo_name-340x82.png Eugene Roux2015-07-25 22:57:552016-01-14 07:31:50650km with very little effort!